I have pretty dry hands and during the gardening season they get even worse from the rough scrubbing needed to remove all the resulting dirt. They quickly become chapped, especially around the cuticles. I’ve tried many different brands of hand creams, but I have never found one that I liked both the scent of and had the power to keep my hands looking good. Plus, the ingredient lists on these creams were SO long…surely a hand cream could be simpler, couldn’t it? Yes, I’ve found, it can. 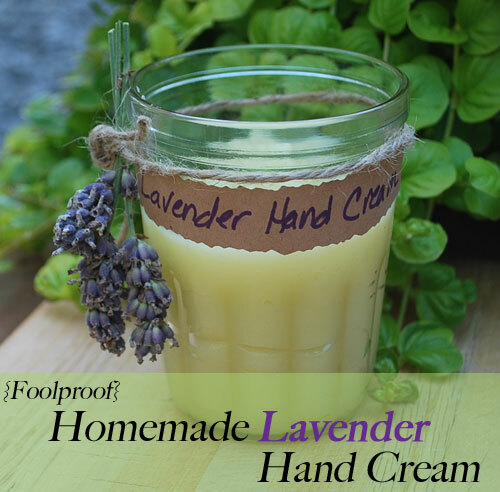 When you make your own Lavender Hand Cream you’ll get simpler ingredients, a foolproof method (no worries about separation), a wonderful light scent, and a cream rich enough to not only keep your hands and cuticles looking good, but also work wonders on your elbows and dry heels as well. Since it’s made with real oils and beeswax, it is, well…oily, so I wouldn’t apply it right before working on the computer or reading a book. It’s perfect, however, for applying before putting on gardening gloves and before going to bed at night, where it has a chance to soak in – protecting and replenishing the skin we can be so rough on during the day. Lavender hand cream also makes a terrific gift and can be adapted to use different scents or even be thinned to use with a pump. Combine the oils in a small saucepan and heat over medium heat just until warm, about 5 minutes. Remove from heat and add the grated beeswax, stirring until the was is completely melted. 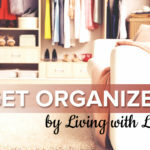 Refrigerate for 5 to 10 minutes to start the oils cooling, then stir in the essential oil (30 drops for less scent, 35 for more). At this point, the cream can be poured into a container (or two containers, if desired) to cool completely. Note: Since this method doesn’t use water, there is no need to use a blender or processor and you won’t have to worry about the cream separating. It will be softer in warmer weather and harder in cooler, but still be spreadable either way. It can be stored at room temperature (storing in the refrigerator will result in a stiffer cream). For a thinner consistency to use with a pump, use only 2 Tablespoons beeswax. 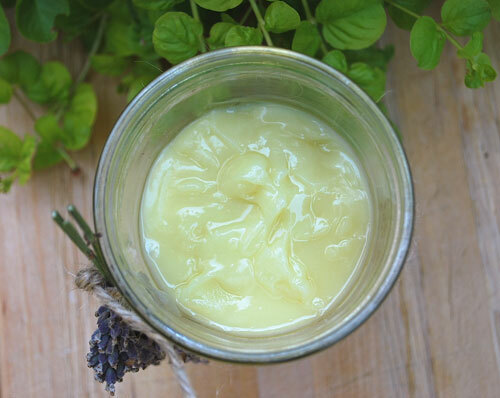 For a thicker, salve-like consistency, use up to 4 Tablespoons beeswax. Replace lavender with the essential oil of your choice like lemon, orange, or another floral scent. Since a little goes a long way, this can be packaged in small tins to give as gifts. Do u have any recipes that don’t include beeswax. I would love to make some for my daughter, but her boyfriend is allergic. There are some, Kim – the beeswax acts a a thickening ingredient (plus all the other goodness from beeswax!). When I was researching this, I found a lot of different recipes just Googling it. You might have to do a few more steps. Hope that helps! To Kim, try using stearic acid powder, I bought some through Amazon. This is a thickening agent that can be used in place of beeswax though you won’t get that waxy consistency. I made a nice coconut hand cream using that powder and it turned out fantastic!! I make a similar blend and use shea butter as my thickening agent. If he is alergic to that you can go a little heaveir on the coconut oil. Where can I purchase bees wax? I purchased mine from Pinetree Garden Seeds (they have an extensive soap-making/herb section), but I know Mountain Rose Herbs also sells it for a reasonable price. Some craft stores carry it as well. This sounds wonderful. I have such dry feet and foot cream is very expensive. 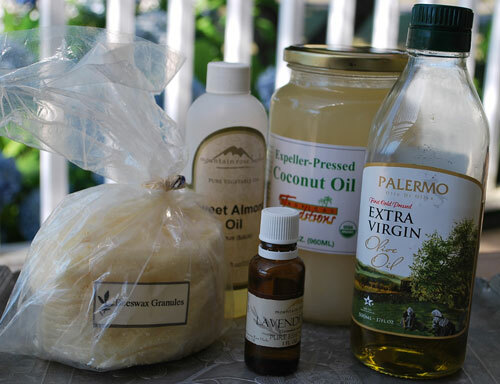 Is there another oil I can substitute the almond oil with? You can substitute almost any oil for the almond – pick one that will be nourishing and give you the qualities you’re after. Jojoba oil should work right? I have a bunch of that on hand. Hi 🙂 I just tried this tonight and the cream seems really oily when applied to the hands. Is it suppose to be like this? If not, is there a way to correct this without putting more bees wax? Thanks! Yes it is very oily unlike water/glycerin based recipes. Use a very small amount. Not sure how well it is absorbed into the skin. I am a sailor and have started experimenting with homemade creams as my hands are like leather and the skin splits at the knuckles. I would suggest grape seed oil. It works great in lotions. Is there something that you recommend to prevent mold and bacteria from growing in this, or does it just have a short shelf life? Heidi, Vitamin E will give it a longer life! 2 capsules or 1/4 teaspoon liquid should so it.. Keep in mind that it is another oil so maybe use it in the almond oil to make it 1/3 Cup. Hi….I used to make beeswax lotions, etc. and I can tell you for sure that lavender essential oil is very potent…VERY. I only used 1-2 drops in a recipe like this. Scented oil is a different story since it is not so fragrant. Another issue is that some people are highly allergic to lavender and beeswax, so this is not for everyone. Essential oils can cause skin irritation even if you are not allergic….so I suggest a very low amount of it in the recipe. Thanks for a great site!! Hi, can i use beeswax pastilles instead of grated? Can i use the lavender leaves instead of the lavender essential oil, if so, i can i incorporate it into the recipe? Try infusing the sweet almond, or whatever oil you are using, with the lavender leaves. Heat your oils on low heat with the lavender leaves in it. Once heated, turn off the heat and allow the leaves to sit in the oil for several hours or overnight. Strain the leaves and use the oils as you normally would. Do know what result you will get as far as the strength of scent, but this is how you would infuse most botanicals with your oils. I purchased some lavender healing cream from a local nursery that is only organic. It does wonders on my hands through this gardening season. It is very creamy, so I don’t use it if I am going to be using my hands for something else right away. I highly recommend it. Can you substitute almond oil for something else? I have a nut allergy. I an a nurse and my hands are so dry with constant hand washing every day. I think I answered this in the comments above as well – yes, you can substitute whatever oil works for you. 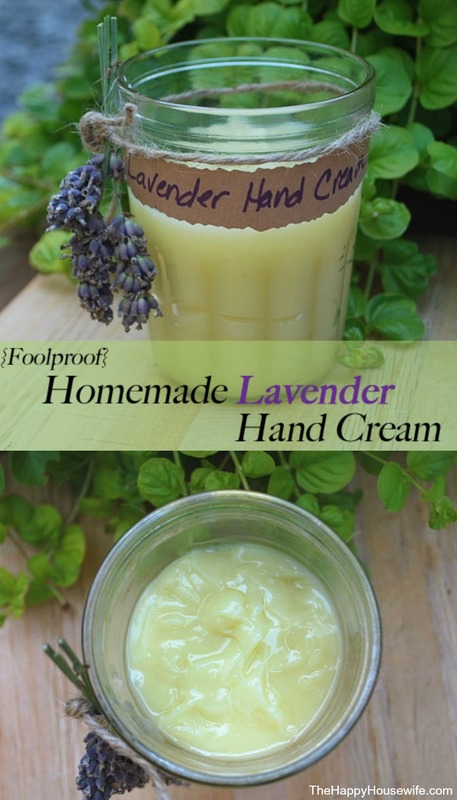 thank you very much for the recipe, i am going through menopause and my skin gets very dry, plus I just love the smell of lavender..i see why you chose beeswax as opposed to shea, the shea will over power the lavender, if you use real shea..thanks again look forward to more ideas. That’s fantastic, we’ll give it a whirl! Do you have any other salve mixes made with base, essential oils & beeswax for treating pain, itches, eczema, face moisturiser etc? I just made up a batch of this for my face, I’m sure I’ll use it on my arms, too, they’re dry. I tweaked the recipe a little I wanted more healing power so I added 1/2 teaspoon of neem oil. And I can’t stand the smell of lavender. Yep, really. So I added 20 drops of rose essential and 10 drops of lemon, my favorite scent combination. I tested it on my hands and was so nice, my skin feels like velvet. I love it! Don’t have almond oil, but I do have grapeseed oil. Okay to substitute? Oh my goodness. Please disregard my previous post. I just noticed the link for the previous posts. Thanks for this recipe!!! I made this cream the other day. I used a mixture of several essential oils including peppermint, eucalyptus, lavender and tea tree. Love it! I have tried every hand cream on the market, and this is hands down the best ever! I have since made several jars for friends. I’d love to know the shelf life too. I made this last night. It’s super greasy. Any way to remedy this? hi! i would like to make this as gift.. but im used to measure by grams and ml, not tablespoons.. so would you please tell me ratio to make total 250 ml? Can I sub sweet almond oil with baby oil or olive oil? I just made this today and I love it!!! Thank you for sharing your recipe. 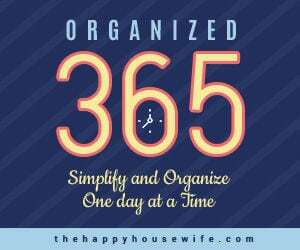 My husband even used it and like it. I make lots of salves with beeswax and olive oil base, some infused and some with essential oils. Beeswax is a great antibiotic and preservative, so those asking about the shelf life – well, I’ve kept some for years and they’ve never gone “off”. You can add a bit of Vit E, or Benzoin Gum as preservatives if you are concerned, but I would only do this if I were selling it. Thanks very much for that info, as I try to figure this all out!